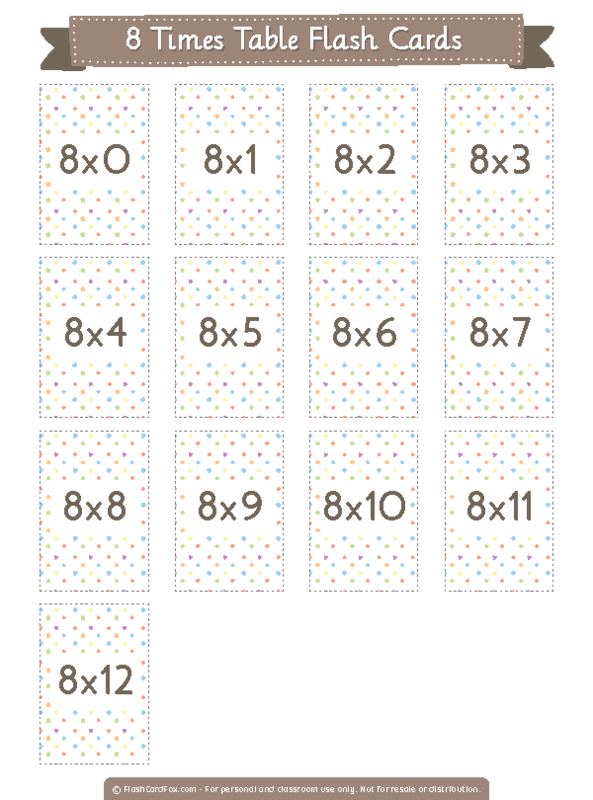 All multiplication problems for 8 and numbers 0 to 12. Download the PDF file for the flashcards. Open the file in Adobe Reader. Other PDF readers may work too, but you should try Adobe Reader if anything displays incorrectly. Print on 8.5 x 11 card stock for best results. Make sure you select "Actual Size" in the printer options so the cards will print in the correct size. Note that the wording for this option may vary depending on the software you use. If you don't see it, look for an option to disable scaling or set the size of the print. Cut out the flash cards with scissors or a paper trimmer. We recommend a paper trimmer for the best results. Laminating the cards will make them more durable. You may get better results by laminating before cutting out. However, you should consult the instructions for your laminator for more information. You may print the flash cards for personal and classroom use. You may not sell or distribute the flash card files or printouts of the flash cards. If you want to share our flash cards with someone, please share the link to the page where the flash cards are hosted rather than sharing the file(s). The flash cards are available in a small size, but we will be adding a larger size in the near future. Large (4 inches x 6 inches) TBD Coming Soon!